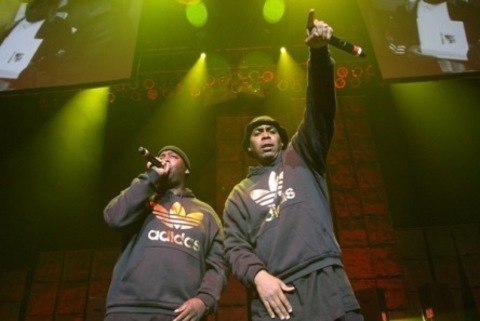 Legendary hip-hop group EPMD were the headliners for the Lawyer for Musicians Hip-Hop Showcase at SXSW. Despite television’s and Hollywood’s frequent attempts to gussy up and dramatize the legal profession (Franklin and Bash anyone? ), most of the real-life attorneys we know have jobs that are about as enthralling as anyone else’s. But when we met Josh Kaplan, a Chicago-based business lawyer and partner at Troglia Kaplan Holzman (TKH) LLC, we found ourselves pretty enthralled with his work. 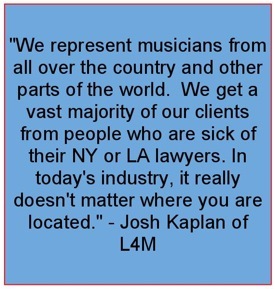 Kaplan is the founder of Lawyer 4 Musicians (L4M), a music business blog. Kaplan is also the legal representation for musical acts and has put together several concerts, most notably L4M’s music showcases at South by Southwest. 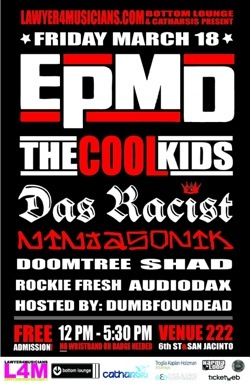 This past March, L4M put together and sponsored a Hip-Hop Showcase at SXSW that featured Chicago rappers the Cool Kids, underground rap sensation Das Racists and legendary hip-hop artists EPMD. We recently caught up with Kaplan to discuss his latest trip to SXSW, how the Das Racist guys commuted to their performance, and why the entertainment industry doesn’t have to revolve around NY and LA. The official flyer for Lawyer for Musicians 2011 SXSW Hip-Hop Showcase. Man Up Chicago: In the documentary Rock The Bells, which was about a putting together a music festival featuring the entire Wu Tang Clan, the festival organizer has to drive to inner city to score ODB some dope. Any fun stories like that in the waning hours before getting EMPD and others on stage for the SXSW concert you helped put together? Josh Kaplan: Das Racist was playing a show that ended about 5 minutes before they were set to go on stage for our show. Oh, and it was completely on the other side of Austin (not easy to get around town during SXSW). So they took a pedi-cab and showed up about 20 minutes late. They then proceeded to dump beer all over the mics and speakers. The crowd loved it. The sound guy did not. MUCh: How did you begin sponsoring shows at SXSW? Do you find yourself doing much on the promotion and booking side of the shows? If so, do you like it? Kaplan: I went to SXSW several years back just to attend. I saw that there were lawyers sponsoring events for other lawyers, but there weren’t any lawyers sponsoring or promoting any of their own clients or putting a show on to attract additional clients. Seemed like kind of a no-brainer. You put on a show to showcase your own clients so they are happy and then other music fans, industry types and other bands can see what you are doing for your clients. I was pretty naive at first and thought I could do it all myself. Tonia (Kaplan’s wife), having experience planning and throwing huge events, sort of laughed at me. I quickly realized I had no clue what I was doing. So, luckily I had Tonia and her team at Catharsis NYC (an integrated marketing agency) to come in and take over. I supplied most of the talent and they did literally everything else; venue, sound system, logistics with bands and managers, dealing with sponsors etc. The shows wouldn’t happen without them. Since the first year, the showcase has grown. We moved to a bigger venue two years ago and then last year we added a second show. It seems like it runs itself, but it certainly does not. MUCh: Did you start L4M.com with the intention of having actual clients? Kaplan: I started it after almost immediately after I started representing musicians. I kept meeting with musicians who really had no idea what their rights were. I looked around for a solid resource but could not find one, so I just started writing about issues and scenarios that I was dealing with as a lawyer and were common for musicians. It evolved from there. We started using it to promote our shows and to write about film issues as well. I have definitely met new clients through the site, but the intention is still to be a resource. The entries on the site, as the disclaimer states, are just for information and guidance and not legal advice. Any time I talk to someone who I meet through the site, I have to let them know that until they sign an engagement letter with me and my firm, I cannot give them legal advice. MUCh: Do you have a pretty unknown — or perhaps forgotten about client — who has something big in the works that you can talk about? MUCh: If a talented musician, actor, comedian, etc. in Chicago makes it big, he or she inevitably ends up in LA or NY. And since you work with creative talent, is a move to one of the coasts imminent? And is it difficult to get respect, from both potential clients as well as music business professionals, because you aren’t based out of NY or LA? Kaplan: Hell no. We represent musicians from all over the country and other parts of the world. We get a vast majority of our clients from people who are sick of their NY or LA lawyers. In today’s industry, it really doesn’t matter where you are located. I make it to the coasts when I need to but other than a few times a year where a face to face meeting is really necessary I could just as easily be headquartered in a shack in rural Montana, as long as there is an Internet connection. Honestly, there is no magic that comes with being on the coast. Plus we are not stuck charging NY or LA rates or glomming onto a percentage of a band’s income (as is typical of coast firms). We can be more creative and flexible because our overhead isn’t as bad, and because we are not looking to screw over musicians. MUCh: Chicago, and even smaller cities, have tons of small music venues, which gives aspiring acts plenty of opportunities to perform. I imagine new groups — and reemerging artists — are eager to play anywhere. But do you think bands overextend themselves and end up risking too much time, personal finances and energy to play concerts that might yield little to no exposure to new fans? Kaplan: Yes and no. Through The Propelr, LLC we manage some bands and we deal with this issue all the time. A common issue for an emerging band is playing too many club dates in one market. If you are playing every weekend, you might make decent money, but your fans will eventually get bored, stop showing up and other clubs will not want to book you in that market. However, to get out of the market where a band has popularity, a band will almost exclusively play before small crowds and lose money while doing so. The key is to try to link with other bands that have a following in the cities your band is touring. If you can do that you already have your crowd present. You’ll probably still lose money because of touring costs, but at least you will get more eyes and ears on your music and possibly sell some merchandise. MUCh: While it seems like some musicians and music biz professionals still like blame the digital age and the Internet for ruining the music industry, do you find that newer musical groups embrace the Internet? And what advice do you give them when it comes to navigating an industry that always seems in flux when it comes to digital rights and music distribution? Kaplan: Man, that is a big question. You should read the articles on the site! (editor’s note: L4M has lots of great articles that expand on this subject.) I would say that a band has to be able to adjust and shift along with the industry. The biggest change that I have seen from the digital age of music is that anyone can make music and get it out to the public. That means that the quantity of music out there is enormous, but the quality has also suffered. It is harder to discover great music and even harder for those making great music to be discovered. The flip side of that is that for a band to get noticed, it has to use the Internet and use it well. Information is king. Assuming a band has good music to get out there, they can still make money doing so even if they are not selling 100,000 cd’s. If a band can track where its fans are, who is buying digital, vinyl, cd’s, merchandise and how much they are spending, they can consistently target those markets and make a living doing so. They can play shows in those markets, do bundle deals in the stores in those markets, hire fans to help them in those markets etc. Also, with that info in hand, it is much easier to prove yourself to a label, if that is the route you want to take. Basically, a band has to have good music and be willing to work their asses off to get it out there, or hire the right team to help them do so. MUCh: Finally, who would be your dream client? And please don’t say Katy Perry because she’s hot. Kaplan: She’s not that hot. I would say the ultimate client would be Jay-Z. Forget about how good his music is, the guy is a brilliant businessman. As a business lawyer first, it would be amazing to be a lawyer for a guy like that. He has his hands in everything from clothing, to booze to an NBA franchise. So many revenue streams. That would be fun.